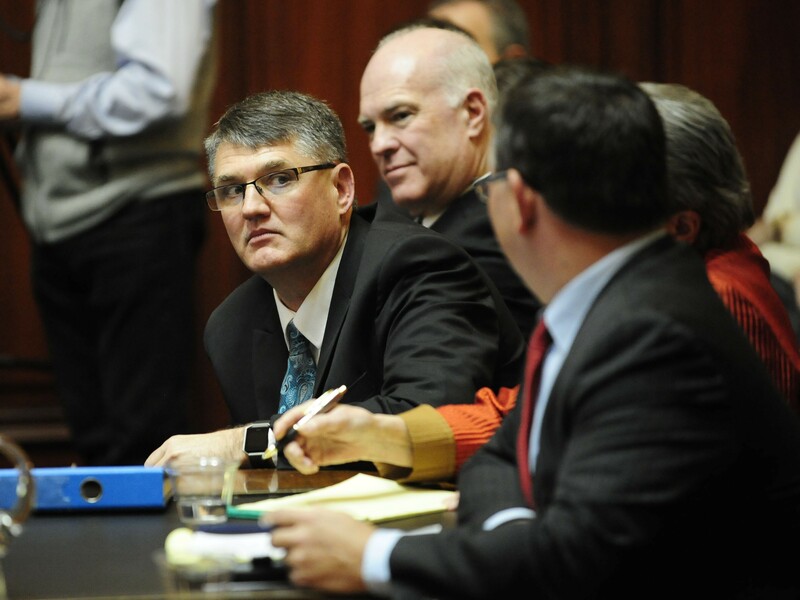 Justice John Dooley weighs in during Tuesday’s hearing about appointing his replacement. “This is an unusual case,” Chief Justice Paul Reiber said Tuesday as the Vermont Supreme Court convened for a hearing about its own appointment process. The man at the center of the case — retiring Justice John Dooley — was among the five presiding over it. A pair of Republicans sued outgoing Democratic Gov. Peter Shumlin to prevent him from choosing the replacement for Dooley, who stated in September that he would step down at the end of his term in April. On December 23, the court blocked Shumlin from choosing a nominee while it considers the case. The justices don’t have much time to deliberate; Shumlin leaves office Thursday. Vermont governors pick from a slate of candidates submitted by the Judicial Nominating Board. But Shumlin is in an apparently unprecedented situation in which the retiring judge isn’t stepping down until after governor-elect Phil Scott takes office. It was standing room only in the State Street courtroom. The case attracted legal buffs, law students and a host of legislators. Hands clasped over his stomach, leaning back in his black leather chair, Dooley didn’t chime in until halfway through the hearing. Among the questions he posed: What might happen if the justices choose not to rule on the case? “Could this court, if it contained a justice that was not constitutionally appointed, render a decision?” he asked. From left, Rep. Don Turner, Sen. Joe Benning and their attorney, Rep. Janssen Willhoit. The plaintiffs framed the case as an issue of semantics that centers upon the meaning of the word “vacancy.” The definition, they argued, is patently obvious. 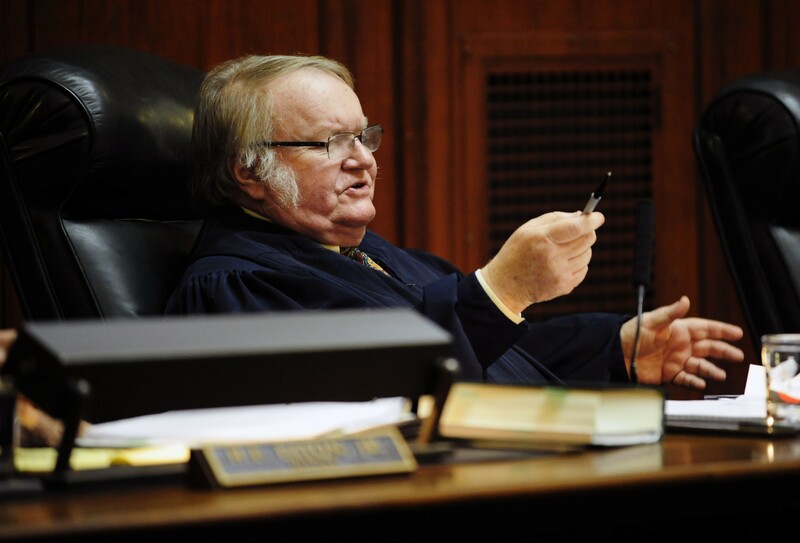 “As everyone in the room can see, there is no vacancy in this court,” declared Rep. Janssen Willhoit (R-St. Johnsbury), an attorney who is representing House Minority Leader Don Turner (R-Milton) and Sen. Joe Benning (R-Caledonia). Representing Shumlin — who did not attend — assistant attorney general Benjamin Battles argued that the plaintiffs lacked legal standing — a question the justices probed as well — and that their case was moot. Regardless of the definition of vacancy, Battles argued, nothing in state law or the state constitution prevents Shumlin from making a nomination. The Senate must approve the pick. The law stipulates that the Judicial Nominating Board “shall” give the governor his candidates when the vacancy occurs or when an incumbent decides not to seek reappointment. Since the board has submitted its six candidates, Battles told the justices, the “constitutional process has been triggered” and Shumlin is simply playing his part in that process. The justices also questioned the role of the Judicial Nominating Board, an 11-member panel that includes state lawmakers and two gubernatorial appointees. “Does the statute give the Judicial Nominating Board the power to determine which governor to send it to?” Dooley asked. Asked that same question after the hearing, Sen. Peg Flory (R-Rutland), who chairs that board, told reporters, “I don’t know.” Flory said Shumlin sent her a letter informing her of a vacancy, but, she noted, he did not specify the date of that vacancy. The court has not yet ruled on the case.